If you've been following my blog for a while now you know that I LOVE shoes. Heels in-particular. I see a lot of shoes daily that I think are nice, but seldomly do I find a pair that at first sight my mouth drops open and a little drool starts to form. I don't know what it is about these Giuseppe Zanotti Colorblock heels that did it for me but dang I'm in love! The combination of the purple, red, and yellow suede with matching crystals, and the extra high heel with hidden platform are just so breathtaking and shocking. These shoes will definitely get a girl noticed! I'm not in love with the price tag though...$1,495! I'm seriously in love with Guiseppe Zanotti Fall 2010/2011 collection (view HERE). So much sparkle and bright colors. 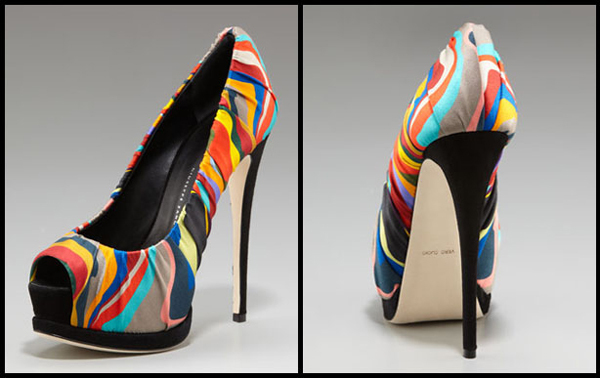 Another shoe that grabbed my attention this week was the multicolor striped pump. This one is a little cheaper- $695. Are you getting the idea I'm loving bright colors right now? Shopbop - Giuseppe Zanotti (HERE)- Great sales! Ohh so gorgeous!! I want a pair! Whew! Those are craaazy shoes.